The best laid plans… go awry regularly. Before we left Green Turtle Cay, while we still had wi-fi, we contacted our UPS mail center and asked them to send our “box-o’-mail” to Vero Beach. For once this worked out perfectly. The fly in the proverbial ointment was our friends at drugstore.com. Nearly every time we order, the package arrives before you can click “submit.” But no, not this time- took a week to get our order, thus helping Vero live up to her name, Velcro Beach, once more. Not our fault, really. We expertly timed our arrival on Monday so that moorings would be available and we snagged #34 all to ourselves for the entire stay. Each night the 57 balls were full, many with 2 boats rafted. The slips stayed full too. The boat next to us ended up with a raft partner who appeared to own a cat. 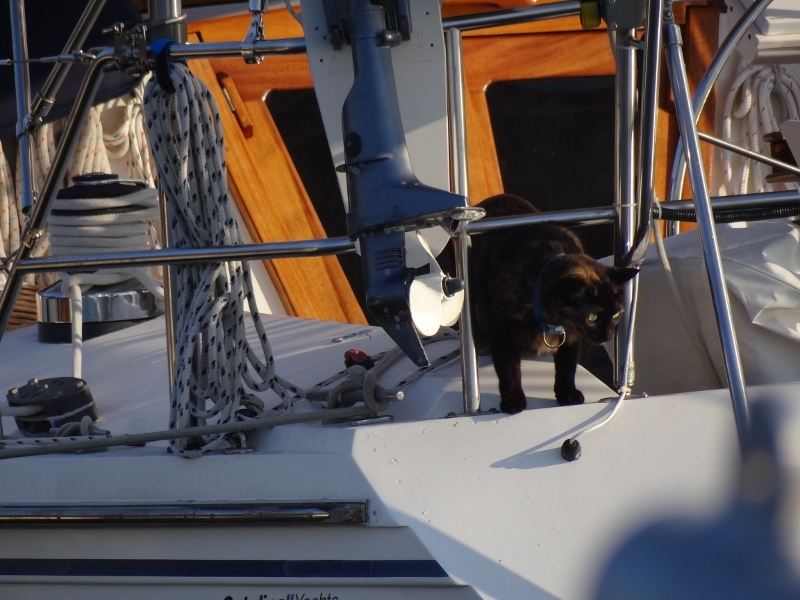 When all people were off the boats, curious kitty nonchalantly checked out the new boat. After these photos, never saw him again. Is that a fish I see? A mega grocery re-stocking trip was in order and we bought so much, between Publix, The Fresh Market and the ABC Liquor Store, that Russ had to agree to a taxi back to the marina. No way could we lug all that on the bus. Oh, wouldn’t that be a sight? You’d think we hadn’t shopped in months, and for much of what we bought you are right-some foods just aren’t available in the Bahamas. Tuesday I made French toast- nothing unusual- just that for the first time, my taste buds said, “Yes! This IS delicious!” Good tasting butter (remember my rant on that slippery topic? ), REAL maple syrup and our own Challah bread. Thursday cooled off to 85 degrees so hey why not bake bread and muffins; we’d hardly notice the added heat- ha! That slow- moving package arrived, leaving us free to go. 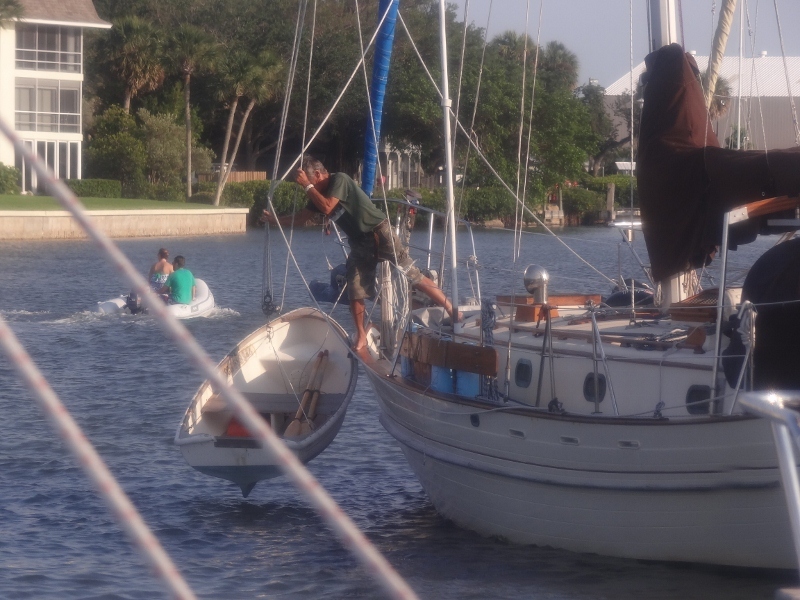 We checked the weather, raised the dinghy, changed our anchorage plans to the new mooring field at Titusville, set the iPhone alarm for 7 a.m. and agreed to head off and eat breakfast underway. Now that we’re back in the ole US of A, the iPhone is on duty as camera, alarm clock, keeper of apps such as Stargazer, FoxNews, Active Captain; email reader/writer, iPod and on- shelf bed pal. The alarm sounds at 7a.m., I immediately check the forecast on The Weather Channel and geeze if we aren’t going to get hit with 20-30mph winds later today and tonight. Eventually Russ pulls up the NOAA weather (WX), we re-evaluate wind and direction in light of the prediction to clock around during the night. Heck, we’re not in that much of a rush to deliberately spend a bouncy night on a mooring or a more sleepless one at anchor hoping we don’t drag. Plus, ideally we’d hoped to at least motor-sail in the ICW but this would not be happening in NE winds. Saturday wasn’t any prize either; Sunday it is for sure!!! Easter; but really it’s all the same. Lamb chops are on the menu no matter where we plop ourselves. Friday evening a cold front passed by and by 8:30 the Garmin display read 22kts, plus. At 8pm the local Coast Guard sector at Fort Pierce announced that two people in a blue canoe just north of the Sebastian inlet were not able to get back to shore and to keep a sharp lookout. By 10:30 when we turned off the electronics I don’t think the canoe had been found. The local fire and rescue squad via small boat and helicopter was searching for the boat which had been spotted in the ICW. The lively north wind would have pushed them south, perhaps on to one of the tiny spoil islands. Assuming they even NEEDED help we hope they are home safe and sound, or as Russ suggested, they were back nursing a brandy at 9:30 oblivious to the search. To my great delight our extended stay allowed us to walk to the Vero Beach “Farmers” Market on Saturday. Now, the fridge and freezer are bursting at the seams. Each trip off the boat to “someplace” makes me think, “Do I bring the camera?” Half the time when it gets left behind I get to say, “Every time I don’t bring the camera, I miss a good shot.” The iPhone often fills in nicely. This was one of those times. At the corner near the marina Russ looks up and sees two parrots sitting on a large branch of a Spanish moss laden southern oak. Even with the iPhone we missed the perfectly framed shot of two, moss dangling on either side. When they flew across the street to another tree we saw at least three more of them. A woman who’d come by with her camera said they were Conyer( ?) parrots. We were so focused (no pun) on getting a shot with the no-zoom iPhone in low light, I’m not sure, but they may have had color near the wings, otherwise all green dudes. I stopped back later; alas no parrots. 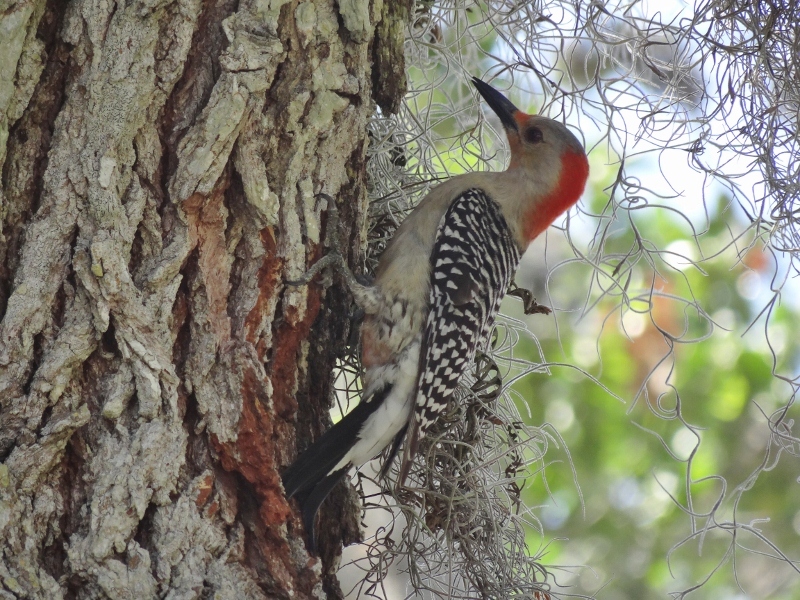 A red-bellied woodpecker pair made up for the missing parrots. The male popped into the convenient tree knot hole before I could get a shot, but I got the female (entire head isn’t red) who appeared to be doing all the work. This entry was posted in Uncategorized and tagged birds, mail. Bookmark the permalink. ← Go. No, wait. Ok, go!